So off I went to contrive a test in Git. That Omnigraffle/Angular thing from a week ago was it. At least as attempt #1 at a disproof. It was also worthy of a blog entry in its own right (a workflow for Svg/Git/Angular). I’ve renamed branches to match the language of the conversation with Joe. Thus as_from_omnigraffle_but_formatted is now A and with_angular_and_html is now B. This change has not been merged to the B branch. 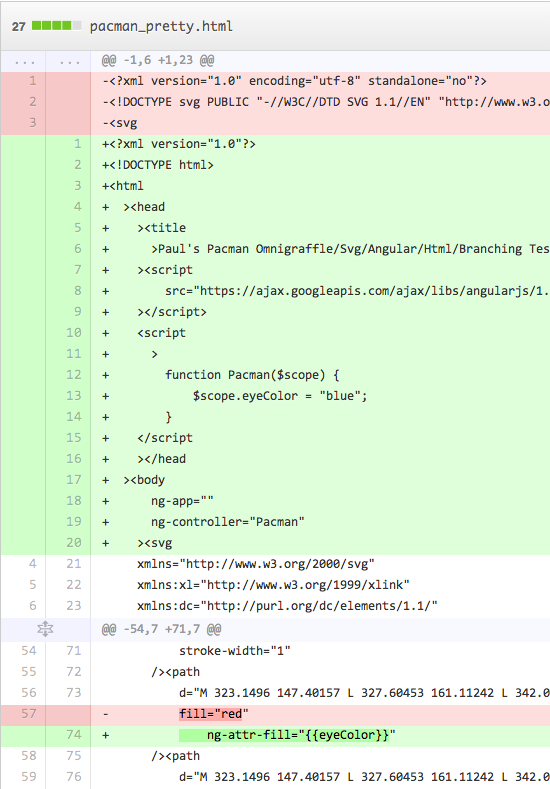 It is now the only A change that has not in some way been merged to the B branch. What I want is the comment from above preserved, and everything else from B brought into A. The file contents should change from pure SVG to HTML with embedded SVG. You can’t see the ‘hello world’ comment from the previous commit, but it is there you just have to expand to see the full file. the @@ comment from before as mentioned. Summary: I’m wrong, Joe’s right.